To The Batpoles! Batman 1966: #032 Pop Goes the Clock King! #032 Pop Goes the Clock King! Where some see a disappointing script from Bill Finger, we see a camp masterpiece! We're talking about The Clock King's Crazy Crimes, which features an amazing riff on pop art (well, and quite a bit of art that isn't actually of the "pop" variety); a Daliesque painting of the Dynamic Duo (who painted it? 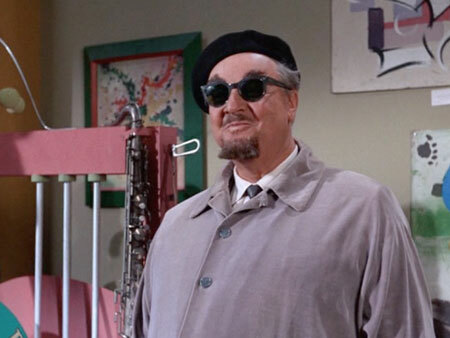 ); another great (but rather subtle) villain theme from Nelson Riddle;Batman and Robin doing some actual detective work;scenes that happen simultaneously and then intersect; and the campiest, flashiest hourglass you ever saw! All this fun also occasions a dig into how comics and the pop art movement fed off each other in the '60s, a Camping Trip into old Hollywood codes for homosexuality (back when you couldn't just admit it! ), and much more. Dress up like an "Artist" and join us!